When people consider retirement in Puerto Escondido one consideration is the quality of medical care. “What happens if I fracture my hip or develop a tumor?” they ask. Up until this year, the answer was that there are excellent facilities in Oaxaca, but you might have to endure a six-hour ride in an ambulance over a bumpy road or arrange to be flown to Mexico City. Quite simply we lacked the diagnostic tools that modern medicine relies on. Now, thanks to the new Toshiba Aquilion One™ CT scanner installed last February at Puerto’s Clínica Ángel del Mar, we have access to the most up-to-date x-ray technology. CT scans can be used to diagnose and monitor a variety of different health conditions, including brain tumors, certain bone conditions, and injuries to internal organs such as the kidneys, liver or spleen. They are also used to look at the heart. 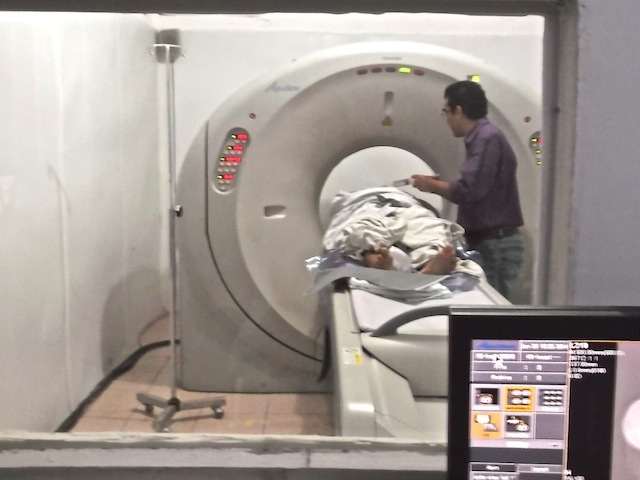 Ángel del Mar has the only CT scanner on the whole Oaxaca Coast. A year ago, the patient from Pinotepa would have had to travel to a facility in Acapulco. The CT scanner is new to Puerto but not to radiologist, Dr. Edgar Logan Lázaro Ruiz who joined the clinic in February. Before coming here, he worked at the Instituto Nacional de Rehabilitación (INR) in Mexico City. He specialized in radiology and the muscular skeletal system at UNAM. A native of Oaxaca City, Dr. Logan first visited Puerto for spring break in 1990, when he was a student at UABJO, and he has come back almost every year since then.